The Quik Cart is a patented, multipurpose collapsible cart with a lid to protect the contents of your cart. It opens up into a large-capacity cart that is ideal for groceries, laundry, office supplies and more. The cart rolls smoothly on rolling rubber wheels. The lid can also be stored on the front panel when not in use. Lid also works as a seat cover so you can take a rest while waiting for the bus, train, taxi or need a place to sit while camping at an outdoor event. You can also use it as a step stool to get into those hard-to-reach cupboards in the kitchen, garage or to change a light bulb. The lid is able to hold up to 250 lb. The base holds 80 lb. Handle extends to 39". 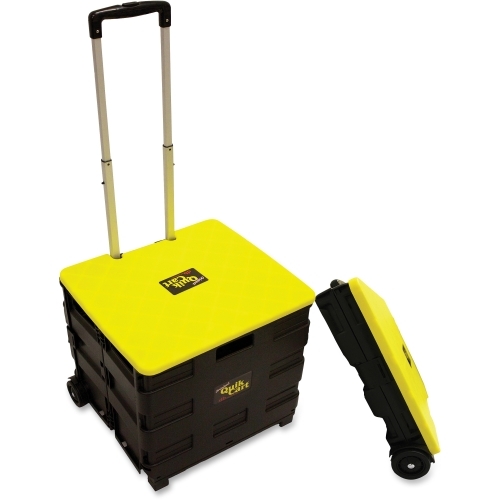 The cart collapses down to only 4" thick for compact storage so it is perfect for your car trunk.